Connecting with people online can help your with both your networking and website marketing efforts. Getting to know more people in your community has no downside in real estate. And, since you’re meeting people who spend time on the web, the chances of them visiting your website and telling their friends about it are much higher than average. So, where to look for online connections? Here are a few sites and tactics that may be worth checking out. Both Yelp and Urbanspoon are popular business review sites. Yelp tends to allow reviews of any business while Urbanspoon is solely focused on the restaurant scene. 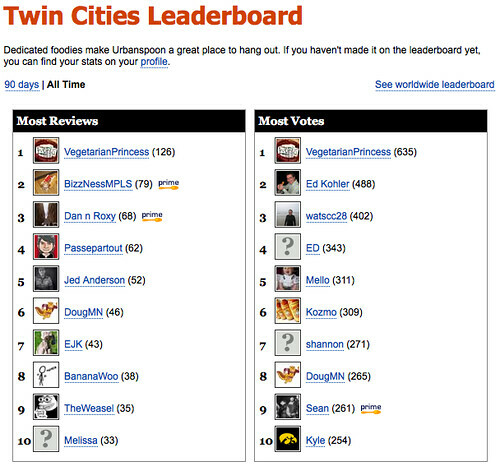 If you look at the Top Contributors page on Urbanspoon for your community, you can see who is going out on the town the most, reviewing the most restaurants, etc. These are web savvy people who manage to get out of the house from time to time. And, if they can afford to dine out often, they may have some financial means. Twitter’s search engine allows for geo-targeted searching, so you can combine a topic that interests you together with your location to find people that may be of interest to you. 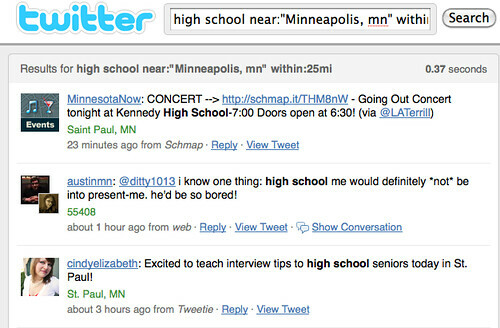 For example, a link to a search result for mentions of “High School” within 25 miles of Minneapolis . . .
. . . brings back a wide variety of mentions of that topic. Not all will be relevant, of course, but you may find some interesting people in your community that are worth following on Twitter in order to start to get to know them. Assuming you’re using Twitter, keep an eye out for mentions of tweetups in your community or in cities you’re visiting. Happy hours or other events that bring together Twitter users help close the gap between online and offline relationships. If no such event exists in your town today, consider being the person who starts it. Mashable has some excellent tips on how to start a Tweetup in your town. Real Estate BarCamps bring together people involved in the real estate industry for learning and networking. Topics vary, but anything related to social media and web technology is usually on the agenda, but there is no limit on where topics may range. Plus, you can always break off with peers to discuss what’s on your mind. If the idea of networking with your competitors doesn’t interest you, keep in mind that other real estate industry professionals also attend BarCamps. Another option is to attend a BarCamp is a different city. This could turn you into the one agent people know from your town. That has referral potential written all over it. Each of the above tactics involves getting in touch with people who both live in your community and are active online. They’re the type of people who’ll use your website, tell others about it, and link to it from their blogs, Twitter, or Facebook. Tech savvy social butterflies. Get to know them. Now it’s your turn. What else would you add to this list?